Annie is gentle around adults, children and other animals too. Due to some past experiences with a previous owner, she does not like to be tied. 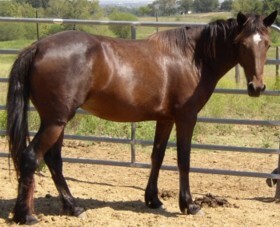 She has great manners on the ground and under saddle and needs a gentle hand when handling her. 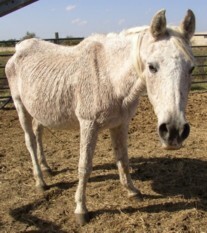 Blanca was donated to TBAR significantly underweight. She measures a ‘1’ on the Henneke Scale used to rate body condition. The scale goes from 1 to 9. She is the least skinny of the three, although this picture doesn’t show just how skinny she is. 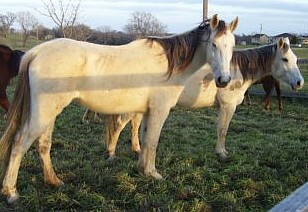 Captain, Dolly and Blanca were all rideable, kid-broke, gentle horses before being neglected.Update: April 14, 2008: Blanca has put on a lot of weight and is looking better every day. 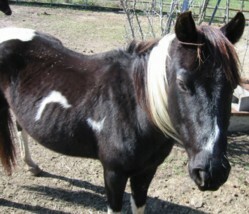 Thanks to your support, she is getting the care and feed he needs to get back to health! Update August 2008: Blanca has a girl of her very own now! Brooke had a bright future. 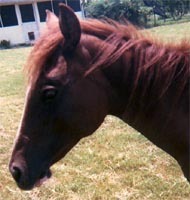 A young, foundation quarter horse filly, with beautiful sorrel coloring; part of a herd of mares and watched over by several stallions – she had her whole life ahead of her. But then the nightmare began. The grass was gone, the grain was gone, the hay was gone – for a long time. 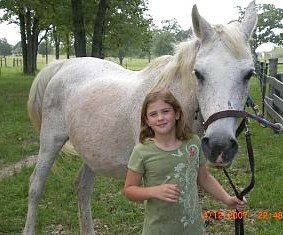 Brooke watched sadly as some of her fellow horses and cows died from lack of food. Only the strongest would survive. The old and the young were the most at risk; and she was one of them. One day, several people with badges came and brought food. It felt good to have a full belly again, even though it would be a long road for Brooke’s body to look healthy again. 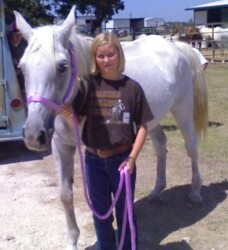 With the help of a lot caring people – some with badges, some who rescue horses – Brooke came to True Blue Animal Rescue. Now, at only 2.5-3 years old, Brooke has a bright future again. She’s halter broke, willing to trust, and ready to start under saddle. 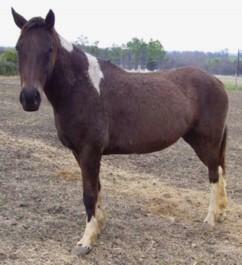 She would make a beautiful addition to your stable. 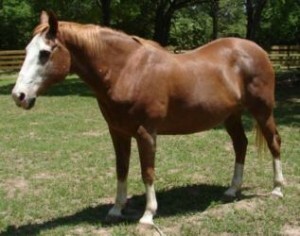 Abilities: Some arthritis in his joints due to old age; but broke to ride and very easy to manage. 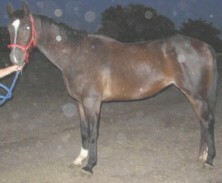 Description: Dolly was donated to TBAR significantly underweight. She measures a ‘1’ on the Henneke Scale used to rate body condition. The scale goes from 1 to 9. Update Dec 2008: Dolly has a forever home! 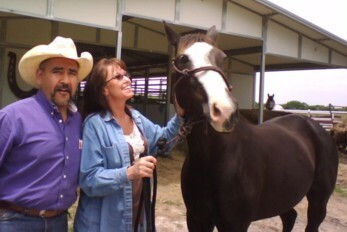 From Dolly’s Home: Dolly is doing great. She has the most personality of any horse I have ever been around. 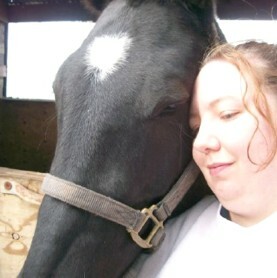 She followed me in the barn and went through a normal sized door into a tack room! We just had her feet trimmed and she fell asleep while the farrier was working! Abilities: Halter broke, accepts a saddle and ready for training. 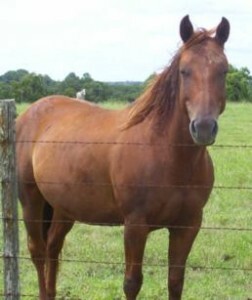 Description: Drifter was one of three horses found estray in Washington County; and transferred to TBAR after no one claimed them. 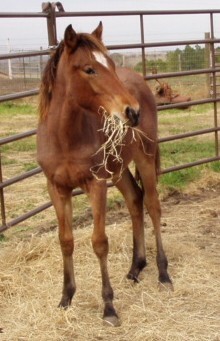 Drifter is halter broke and ready for training. Abilities: George is broke to ride and gentle with kids. 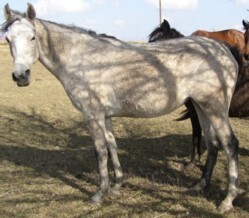 He is flat footed and needs special care by the farrier. He is very gentle and easy to handle. 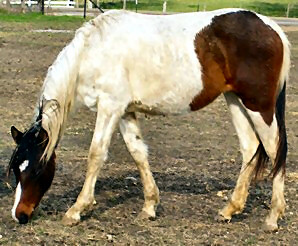 Update: April 14, 2008: Gracie has put on a lot of weight and her winter coat is shedding out in chunks! It’s hard to catch her with her head up, she’s eating all the time. Thanks to your support, Gracie is getting the care and feed she needs to get back to health! 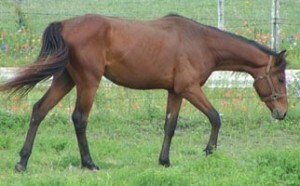 Description: Riverdancer has had lots of groundwork and been ridden some with an experienced English rider. She is the alpha mare in the pasture Riverdancer is cautious around people at first, but warms up and is then very sweet. 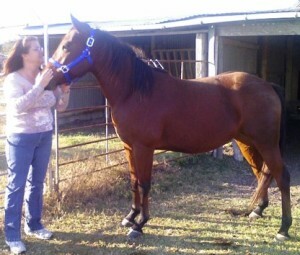 She needs an experienced rider and will do great with children with some more training.. The little cloudy spot on her left eye is from an old injury, but it’s cosmetic – it doesn’t cause her any difficulty or vision problems. 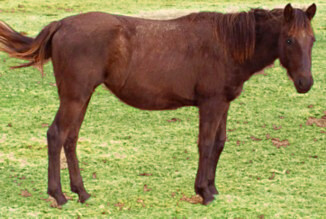 Abilities: She is halter broke, gentle on the ground. Rosey is rideable; and needs an experienced rider. Description: Rosey’s life had taken a dire turn; and she didn’t know how much longer she could go on. 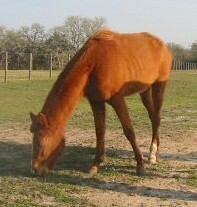 She and 3 other horses shared a small pasture in the country that had long since run out of grass. Water was scarce, and there was no cover from the winter weather. 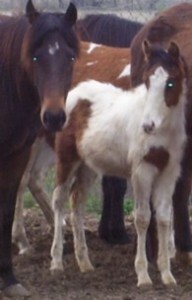 When the owner did bring some food, Rosey and the 2 other horses let the baby horse eat first. Then the older boy horse, Chief, let the two girls – Rosey and Duchess – eat next; but it showed. He was skin and bones. 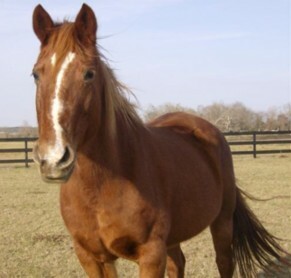 Thankfully, the authorities seized Rosey and the other horses; and the court awarded them to True Blue Animal Rescue where they could be rehabilitated. Rosey is halter-broke, has fabulous ground manners and is probably rideable. 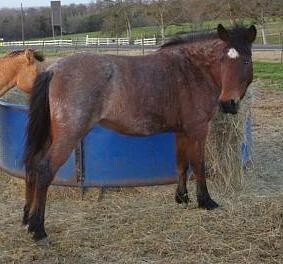 A beautiful, 10 year old strawberry roan, Rosey is healthy again and ready for a loving, forever home. 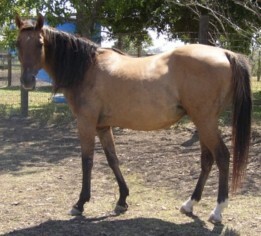 Description: Once upon a time, a skinny mare was rescued from her sad situation and brought into True Blue Animal Rescue (TBAR) for rehabilitation. Turns out this poor girl was not only trying to sustain herself on the little food that was available, she was also trying to feed her baby. Fortunately, with the good food and TLC at TBAR, this mom had a healthy baby girl. 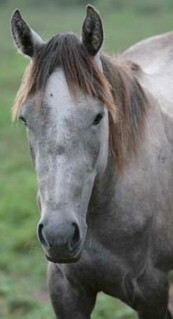 Being the first baby born into TBAR, she was named True Blue. 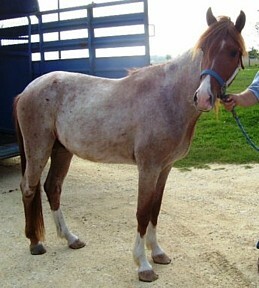 Fast forwarding to the present, True Blue has grown up into a beautiful three year old ready to start under saddle. She has deep brown, soft eyes that show her gentle, loving character. Her most stunning feature is the white heart on her forehead. 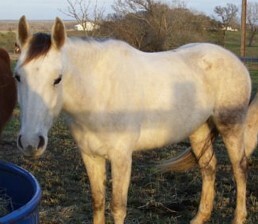 If you’re looking for a young, beautiful horse to train, True Blue might be just right for you! 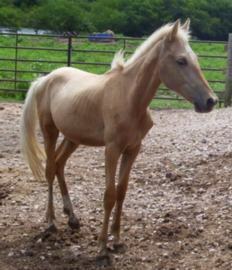 She is current on her vaccinations and Coggins negative. 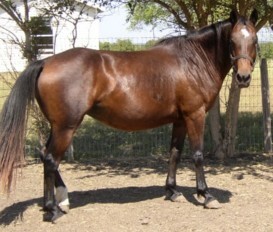 Description: Valentino was donated to TBAR on Valentine’s Day and registered a 1 on the Henneke Body Scale. That is as low as the scale goes. His winter fur his his true emaciated condition. 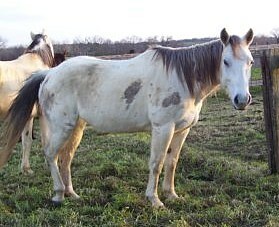 He looked as bad as Gracie, his pasture companion. 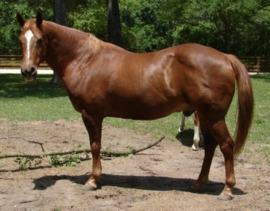 Apache has put on alot of weight and is now in a loving foster home that wants to adopt her!! 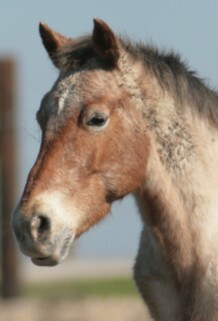 Description: Cheyenne’s baby, born March 2006. 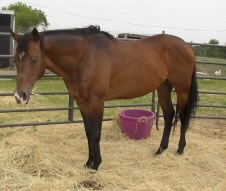 Art has been gelded and is now available for adoption. Description: Beauregard is a retired barrel racer. He is very easy to handle, a real gentleman, a great companion and bonded with Timex. They would like to be adopted together. 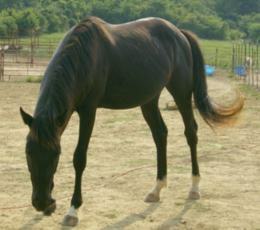 Timex had laminitis a year ago and requires special shoes until he is fully recovered. 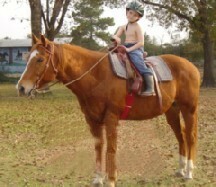 When his hooves grow out a little more, he can be ridden by children and lead-line riding. 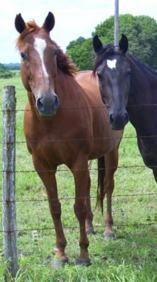 If you’re looking for a sweet, gentle horse for the grandkids, consider Timex and Beauregard. 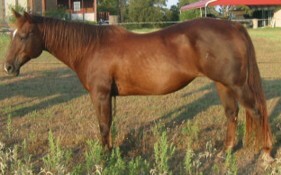 Abilities: This horse has put on weight beautifully and is halter broke. Doesn’t she have beautiful color? 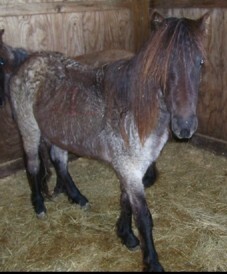 Otis below is her foal and has been weaned. 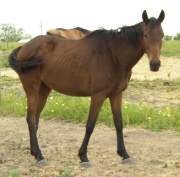 Description: Faith was donated to TBAR due to neglect and malnutrition. 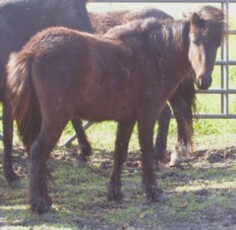 She is significantly underweight and will need to put on weight before being adopted. Click on Faiths name for more pictures. 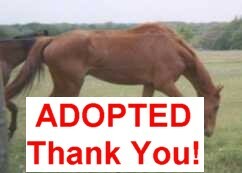 Update 4/2007: Faith is almost back to her ideal weight and just went to her new forever home! 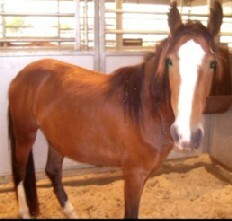 Abilities: Jett is easily trained; has been gelded and halter broke.. Description: Naimi is a genuine Shoshone Indian mustang – a real part of our American heritage!She was one of 12 mustangs brought to TBAR; her mom was among 980 wild horses that roamed free 400 miles north of Las Vegas on what was Shoshone Indian land. 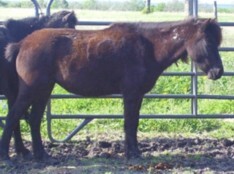 By way of roundup, purchase, then a seizure for animal neglect, Naimi ended up at True Blue Animal Rescue (TBAR). 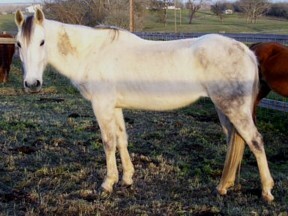 Naimi was just a weanling when she came to TBAR, and has grown up into a beautiful, bay two year old mare with flashy white markings. 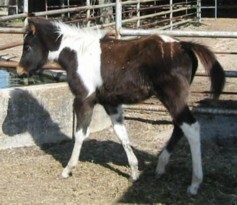 Typical of mustangs, she is small and will grow to be about 14 hands. Naimi is willing to please; and very people friendly. 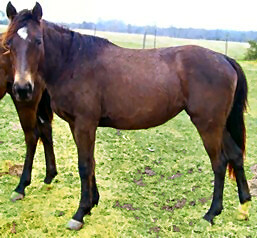 She is halter broke, ready to start under saddle; and would make a great kids horse prospect. 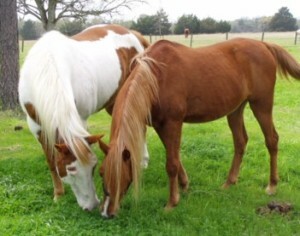 Mustangs represent all that’s loved about horses – free spirit, power, grace and beauty. Adopt some American history and American spirit – adopt Naimi! 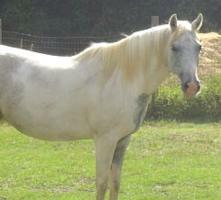 Riding Abilities: Paris was born with long pasterns and will be adopted out as a companion animal only. A beautiful one! 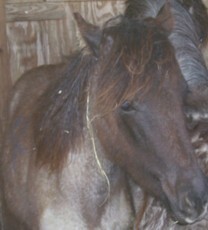 She is searching for an adoptive or foster family. 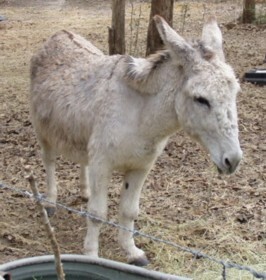 Abilities: Nice donkey that is gentle with kids. Likes to be brushed. 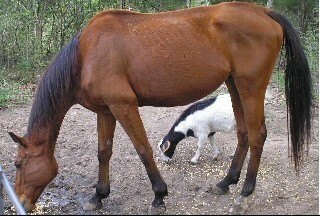 Gets along with other horses and cows. 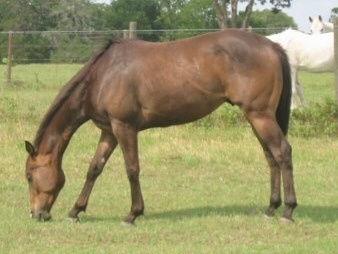 Riding Abilities: Special T is a striking mare that catches your eye. And if you’re part of the 75% of horse owners that never rides, then consider adopting this beautiful horse for your backyard!Special T was brought to TBAR with a serious injury on her withers, and thanks to TBAR and lots of vet attention, the injury has healed. 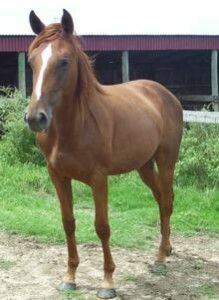 However, it was serious enough to cause bone damage and therefore, Special T is adoptable as a companion horse only; but a GORGEOUS companion she’ll be! 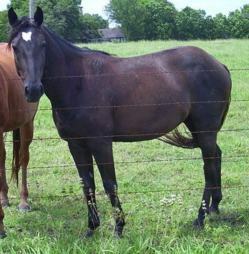 Description: Timex is a retired barrel racer who is very easy to handle, a gentle companion and a sweetheart. He is bonded with his buddy, Beauregard. 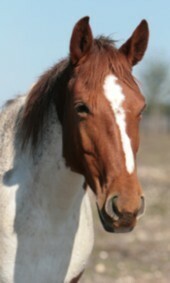 Timex has an old stifle injury so he is available as a beautiful pasture ornament and a grooming buddy only. If you’re looking for a sweet, gentle horse for the grandkids, consider Timex and Beauregard. 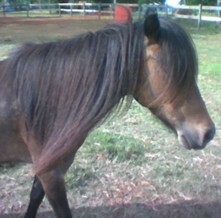 Description: Babe is a beautiful pony with a long, flowing mane that goes down to her shoulder. She has a gentle nature and should be easy to train. 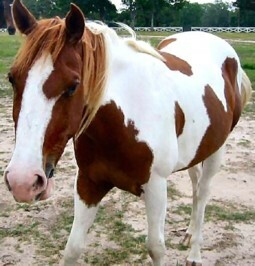 She is willing to trust you and have you be her “lead horse”. 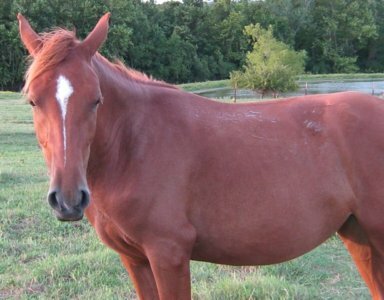 Riding Abilities: Gemma is a very long, easy going quarterhorse. She is safe with kids and pretty bomb proof. She’s perfect for light riding. Boomer, now called Romeo, has found a forever home where he is loved and adored and makes his owner’s heart sing every time she looks at him. 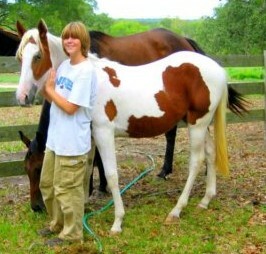 He is her dream horse! Her favorite time with Romeo so far is taking him for a walk around the 88 acres of his new home, checking out the sights, and letting him munch on the green grass. Pictured here with his new best friend, Amigo.